Covers foundation skills that allow employees to meet the minimum requirements to perform a job. 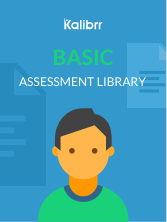 These assessments screen for ability to learn new information, ability to articulate thoughts, comprehend instructions and ability to document using basic computer applications. Foundation Skills are required in every job. This measures ability to grasp and comprehend fully and completely explicit and implicit information of written communication.